This spring make sure to be prepared for excess rain and flooding. Many homes will succumb to large amounts of rainfall this spring and it is best to know how to handle this issue when and if it occurs. Having a handle on flood insurance costs and cleanup will save you time and money in the long run. Making sure you have an up to date insurance policy can always save you money. Many insurance companies will cover rain damage, but it stop at that. A lot of companies leave out flooding from ground water, snow melting and/or seeping water. ConsumerReports outlines what is covered and why flood insurance is a good idea even in low- to moderate-risk areas. Not having full coverage flood insurance can cost you a lot in the long run. As stated in Floodsmart.gov, there are many factors to consider when dealing with flood insurance. 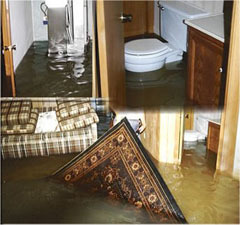 There are many natural disasters that can cause major flooding in your home. These include snowmelt, mudflows, flash floods, heavy rains, spring thaw and floods after fires. All of these circumstances can change the game of flood insurance. Many people may only have minimal flood insurance. Like stated before, your insurance company may only cover direct rainfall, not the side affects. If you are thinking about moving or just increasing your flood insurance, FEMA (Federal Emergency Management Agency) allows you to review flood maps around the country with their flood insurance rate maps. This allows you and your insurance company to determine the risk level of your home’s location. If you feel that your home is in an area of high risk flooding you may need to change your flood insurance coverage, thus changing your flood insurance costs in the long run. Once your risk profile is determined, consider the damage costs that your home may sustain, this will help determine the type of package you purchase from your insurance company. The average homeowner in a single family home spends about $400-$500 a year in flood insurance costs. In low risk areas, this number can be reduced to almost $100 whereas areas with high-risk flooding, the flood insurance costs could reach almost $2,000. 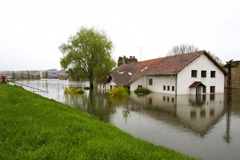 The general residential flood insurance covers physical damage costs up to $250,000. Anything over this amount requires a separate policy, in which many insurance companies may not even provide. Even minimal amounts of water can produce thousands of dollars worth of damage for your home. In the past 5 years, the average paid flood insurance claim was nearly $34,000. Flood insurance is a way to make sure you, your family and home are protected from this disaster. Flood insurance is available to homeowners, renters, condo owners, renters, and commercial owners/renters. Insurance costs depend on your insurance company, how much insurance is purchased, what is covered and the property’s flood risk. All policy forms provide coverage for buildings and contents. However, discussing your personal property loss with your insurance provider can be beneficially since contents coverage is optional. Many insurance companies will cover the damage to the home but may not necessarily cover the loss of your personal property. Normally, there is a 30-day waiting period from date of purchase before your policy goes into effect. The sooner you purchase your flood insurance the better protected you are. Flood insurance costs differentiate from state to state. Regardless if you live in a high-risk flood area or not, you should have some type of flood insurance for your home. Water can create problems even if you live in dry areas. Flood insurance can help protect you, your family and your home from this type of disaster.